The District 3 work picture continues to be strong with many new projects on the horizon. Comet Electric is currently providing electrical support at the airport for the new Consolidated rent-a- car center (CONRAC), and the Landside Access Modernization Project (LAMP) which will clear the path for some extensive work for Local 11. LAX also has the Mid Field satellite Concourse under construction with over 200 members working for multiple contractors, as well as work in some of the other terminals. Inglewood Stadium is rapidly approaching 500 members with Rosendin and Morrow Meadows Joint Venture leading the way. And with a 2020 completion date, some overtime should be inevitable. Our local is seeing a lot of lighting retrofitting in our public schools right now. 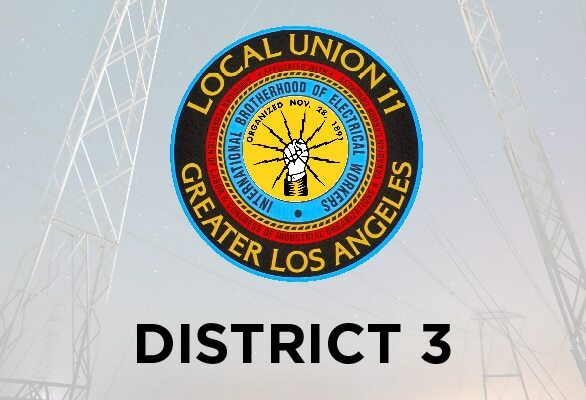 Notably in District 3 is Baker Electric working in our Santa Monica and Malibu School Districts. Rosendin is also working on the remodeling of the Century Plaza Hotel with a fairly good-sized crew. Not to mention continued work on the Purple line in that same area. Anybody who checks the jobs board knows SB-54 created a lot of work in our refineries. District 3 is the home of the Chevron Refinery where Contra Costa has assumed the maintenance and projects duties. They currently have 50 members working there, and are looking to add some more members in 2019. As you can see, we have our share of work on the west side. We would like to recognize all the stewards local wide for helping to represent the membership. They play a vital part in our local union and should be appreciated by all. I encourage all members to make a commitment to attend a few of our many monthly unit meetings. It’s how you can stay informed with what’s going on in YOUR union. We need everyone to be energized and engaged in this contract year. And maybe you’ll see some old brothers and sisters you haven’t seen in a while, and maybe a few new ones. Plus, you’ll get fed!! What could be better? As always, it’s an honor and a privilege to serve our membership.